We use the Intense Photo Spray - a breakthrough topical photosensitiser designed to work in combination with Ellipse I2PL treatment for wrinkle reduction. Ellipse wrinkle reduction treatment delivers visible improvements in as little as one month. The photosensitiser is liposome encapsulated to safely and effectively transport the active ingredient deep beneath the surface of the skin. The spray ensures results with even greater safety. 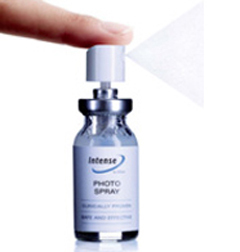 Once Intense Photo Spray is absorbed into the skin, the formula's active ingredient is converted into protoporphyrin IX (PpIX). When activated by an appropriate light wavelength, a cytotoxic reaction begins in the treated skin cell. This triggers a cellular repair response and stimulates local collagen production. Externally the result is visible filling of facial wrinkles.